Cash back credit cards are a useful tool to get paid back for the things you buy every day. Many cards offer flat cash back for all purchases, while others offer higher cash back across rotating categories like dining, groceries and shopping. We researched 682 cash back card offers and narrowed them down to our top recommendations. Browse our editor's picks for the 10 best cash back offers from our partners and find a card that fits your spending habits. Earn 2% cash back at gas stations and restaurants on up to $1,000 in combined purchases each quarter. Earn 1% unlimited cash back on all other purchases – automatically. Earn 5% cash back in rotating categories each quarter like gas stations, grocery stores, restaurants, Amazon.com and more, up to the quarterly maximum each time you activate. Our experts at CreditCards.com have pulled together the best cash back credit cards for you in various spending categories. Each card has different rewards and fees, but we make it easy for you to decide on which is best for your spending habits. Choosing a credit card is an important financial decision, so we lay out the pros and cons for you all in one place. We evaluated over 600 credit card offers using the criteria below to come up with our list of the top cards for cash back. Here are our findings. What is a cash back card? Whether you want to know what to look for in a cash back card or how to use it, we can help. The Chase Freedom Unlimited is arguably the best cash back credit card. Not only does it offer one of the best cash back rates, but it also comes with flexible redemption options through the Chase Ultimate Rewards portal. After analyzing 600+ card offers, we've hand-selected the 10 best cash back credit cards. 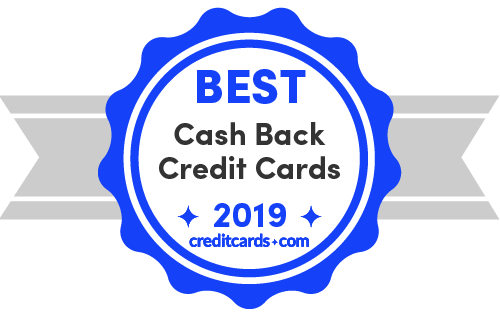 The Capital One Savor Cash Rewards and Discover it Cash Back cards offer tiered cash back rewards across several categories and are our top picks due to their high rewards value and flexibility in redeeming cash back. The best credit card for you will depend on your personal needs and preferences. Here's our take on 2019's best cash back cards with pros and cons to consider for each offer. Feel free to email us at editors@creditcards.com if you have any questions! Other cards chase the Freedom Unlimited's first-year and ongoing cash back rewards, but this card is a tough one to beat. You can earn 3% cash back on all purchases on up to $20,000 in your first year, then unlimited 1.5% back on all purchases after that. The Freedom Unlimited can be partnered with a Chase Sapphire card to take advantage of the travel boost those cards offer through the Chase Ultimate Rewards portal. There's also no annual fee. Finally, you can get a 0% intro APR for 15 months on purchases and balance transfers (then 17.24% - 25.99% variable). The Freedom Unlimited may not be the best choice for world travel, with its 3% foreign transaction fee. Also, the balance transfer fee is high, at 3% or $5, whichever is higher. The go-to rate also starts out high, at a variable rate of 17.24% - 25.99% APR. This card comes with a twist – rather than a sign-up bonus, Discover will automatically match all the cash back you earn at the end of your first year, encouraging your love and devotion. There's 5% cash back each quarter on rotating categories such as Amazon.com, grocery stores and wholesale clubs up to the quarterly maximum each time you activate. Discover recently unveiled all of its bonus categories for 2019, beginning with grocery stores in Q1. If you like the idea of working towards maximum rewards, this card is a good choice for you, because you could potentially earn up to $600 at year end by earning 5% back up to $1,500 each quarter and the cash back match at the end of the first year (activation required). You can also receive free Social Security number alerts, a special feature of Discover cards. While competitive, Discover as a network is not as robust as Mastercard and Visa and is accepted at fewer locations. Also, you'll need to decide if rotating categories are for you as they require a bit more legwork than a flat-rate cash back card. If you're looking for a card with all the boxes checked, you'll want to eye the Capital One Quicksilver Card. It has competitive rewards with 1.5% back on all purchases and a decent sign-up bonus of $150 after spending $500 in the first 3 months. The Quicksilver also comes with 15 months of 0% APR and reasonable regular APR of 16.24% - 26.24% variable for both purchases and balance transfers. With the 1.5% back on all purchases, you don't have to deal with the hassle of rotating categories or quarterly sign-ups. Also, you won't have to choose between an introductory APR and rewards, because this card has both. Finally, there is no annual fee and no foreign transaction fee. The sign-up bonus isn't the highest, with the BofA Cash Rewards card now offering $200 back with a $500 spend within the first 90 days, while some luxury cards offer even larger sums. And the required credit of good to excellent is a high bar for someone whose credit isn't the best. The Cash+ card offers high rewards but requires (relatively) high maintenance. This card is not for everyone and we do not recommend it for beginners, but advanced cash-back cardholders may enjoy it immensely. There is a high degree of customizability, to an extent that is unseen in other cards. From a decent list of options, you can choose the 2 categories in which your purchases earn 5% back. Additionally, you can select a category in which you earn 2% back, from yet another set of options which include everyday purchases like gas stations and grocery stores. There is no annual fee and you get a standard but respectable sign-up bonus of $150 for spending $500 in the first 90 days. A high amount of legwork is required, as you need to select and activate your categories each quarter. Furthermore, the 5% categories are subject to a quarterly limit of $2,000 in combined eligible net purchases. These categories, while solid, are a bit niche – a few examples include movie theaters, fast food, and electronics stores. The revamped Savor card from Capital One is one of our favorite cash back cards. Not only does it offer high percentages in desirable categories, but it also comes with an intro bonus offer that blows all others out of the water. If you frequently find yourself eating at restaurants or ordering food to dine in, you'll love the Savor's 4% back on dining. That 4% also extends to entertainment purchases such as movies, concerts, sporting events, and more. There's also 2% back at grocery stores. Equally impressive, if not more so, is the Savor's sign-up bonus of $500 in cash rewards for spending $3,000 in the first 3 months; the bonus amount and required spend are both very favorable. Although it is waived for the first year, you'll be looking at a $95 annual fee after that. The SavorOne is the little brother of the Savor card. While it comes with some lower cash back and a smaller sign-up bonus, the SavorOne still packs a mighty punch and is great for daily use. The SavorOne offers a hearty 3% cash back on dining and entertainment, as well as 2% back at grocery stores and 1% on all other purchases. It's ideal if you lead an outgoing lifestyle and are looking for a card without an annual fee. It also has no foreign transaction fee, which makes it suitable for use abroad. The sign-up bonus and cash back rate on dining and entertainment are lower than its big brother, the Savor card, but this is to be expected in exchange for no annual fee. The recently revamped Propel card is something of a jack of all trades, offering cash back on multiple popular categories. Holistically, it is a strong and well-rounded credit card. The ability to earn 3% back on travel, gas stations, and dining makes this card a useful instrument for the adventurous. Its sign-up bonus – which is redeemable for $300 after spending $3,000 in the first 3 months – is quite a decent size. All told, the Propel offers a lot of attractive features for a credit card that charges no annual fee. With required credit ranging from good to excellent, it may be difficult for someone with less-than-stellar credit to obtain this card. This card has a welcome offer of $150 after you spend $1,000 in the first 3 months, as well as 3% cash back at U.S. supermarkets (on up to $6,000 in purchases per year, then 1%), 2% cash back at U.S. gas stations and select U.S. department stores, and 1% cash back on all other purchases. 3% at U.S. supermarkets is far higher than the cash back rates offered by most credit cards for those types of purchases. Cash back in the additional categories are also solid, and the card charges no annual fee. It also helps that Amex is consistently ranked among the top 2 credit card companies in terms of customer service. The intro bonus requires a higher spend compared to many competing cards which only require a $500 spend in 3 months. This card's $200 back after a $1,000 spend within 3 months of card membership is hard to beat, and it comes with the standard 1.5% back on all purchases. The Cash Wise also delivers 1.8% cash rewards on qualified mobile wallet purchases during the first 12 months on account opening. With the Cash Wise, you can get up to $600 protection on your cellphone (with a $25 deductible) for covered damage or theft when you pay your monthly cell bill with this card. Also, excellent credit may not be necessary, which means you might be accepted with a score as low as 670. Finally, there's no hassle of quarterly sign-ups or changing categories. The 0% intro APR offer isn't the greatest, with only 12 months on purchases and qualifying balance transfers (then variable APR of 16.24% - 28.24% applies), the latter of which must be made within 120 days to enjoy the intro rates. You can do better on this front with the Chase Freedom. There's also a foreign transaction fee of 3%, which may not be the best choice for overseas travel. And there are cards that offer a better cashback rate on everyday purchases, such as the Blue Cash products from American Express. What are cash back cards and how do they work? Cash back cards are pretty straightforward – they allow you to earn cash for spending on your favorite card. Once you build your credit and know how to manage your credit cards, it's time to think about rewards. And cash back rewards can be among the most straightforward of the rewards cards out there, making them a great starter product. Whether you choose a card with a flat rate or a product with rotating categories, this is a great way to earn cash while making purchases. Here's how it works: Let's say you spend $500 a month and the cash back rate is 5% on specific categories. That means you are earning $25 a month just for card loyalty. There are sometimes spending requirements and sign-up rules, though. Cash back cards will usually also have a sign-up bonus of up to $200 back, so be sure to shop around. However, as with all rewards cards, you need to be sure to pay in full each month, because otherwise, you'll pay interest charges on the balance each month, and that would defeat the purpose of having a rewards card. Among different types of rewards cards, cash back is by far the most popular among consumers, according to our recent survey, which was conducted by YouGov with a sample of 698 American adults. According to industry analyst Ted Rossman, this is not too surprising; cash back is popular "in large part because it's easy. Most credit cardholders like straightforward ways to earn and redeem their rewards, and cash back credit cards offer both." While there are more specific types of rewards cards out there, "cash back credit cards have universal appeal." Ongoing rewards. Rewards can vary widely, sometimes with maximum spends and sometimes unlimited. Sign-up bonus. Most have a bonus, typically of $150 after a set amount of spend. Special features. Some cards have features like damage and loss insurance on cellphones. Benefits. Many of these cards offer auto rental insurance, price protection and more. Look at your lifestyle and see if there is a benefit that makes the card worth your while. Before choosing a card, think through how you spend. If you eat out at restaurants, the Capital One Savor might be a good choice. But if you have a sizeable family and spend hundreds a month on groceries, one of the Blue Cash products might be for you. Look at your past spending to see where you shop and how much. Which are the best cash back card companies? Discover – The Discover it cards match your cash back at the end of your first year instead of a sign-up bonus. American Express – American Express' Blue Cash Preferred and Everyday cards offer higher rates for U.S. supermarkets that are year-round. Chase – The Freedom and Freedom Unlimited can be partnered with Sapphire cards, giving you a boost when you book travel through Chase Ultimate Rewards. Bank of America – BofA offers several competitive cash back cards which can be especially lucrative if you are a Preferred Rewards client. Wells Fargo – This bank's cash back cards, such as the Cash Wise, offer cellphone protection, up to $600 (subject to a $25 deductible), when you pay your cell phone bill with the card. Which cash back card is right for you? Because there are a number of cash back cards to choose from, and each has its own advantages, it's best to analyze your spending habits before choosing. Are you up for maximizing spending on specific categories every 3 months? Or would you rather set it and forget it, which a flat-rate card allows you to do? If you shop often at U.S. supermarkets – A Blue Cash product is a good choice. If you like the idea of maximizing rewards – A Discover it Cash Back or Chase Freedom might work best. If you want to set it and forget it – With a Chase Freedom Unlimited or Capital One Quicksilver, you can earn cash back every time you make a purchase. If you eat out often – A Savor or SavorOne earns you boosted cash back for dining and entertainment. If you are disciplined – Can you only spend what you can afford to pay back? Then a cash back card is a good option. If you want practice – If you want to try out rewards, but you are concerned that you aren't ready, the simple features of a flat-rate cash back card is a good choice. If you don't need a card for travel – In many cases, cash back cards have foreign transaction fees, so they are best for everyday spending rather than international purchases. What are the different types of cash back cards? Flat rate. Flat-rate cards typically offer 1.5% on all purchases, allowing you to not worry about maximum spends or quarterly sign-ups. However, the rewards are lower, which is the tradeoff for not having to think about what and where you are making purchases. Multiple tiers. Some cards, such as the Blue Cash cards, offer boosted cash back on specific categories. The rate is year-round in this case, but there may be a maximum spend required. For example, the Blue Cash Preferred earns you 6% at U.S. supermarkets, although there is a maximum of $6,000 a year (then it's 1% after that). Rotating categories. This type of cash back card requires the most thinking because select categories reward you with, for example, 5% back for a specific amount of time, typically 3 months. You have to sign up for the categories each quarter and you have to pay attention to when and where you make purchases. Hybrid. The U.S. Bank Cash+ Visa Signature offers a unique rewards program that combines the tiered program with the rotating categories program. You earn 5% back on 2 categories of your choice each quarter, and there's the added advantage that you get a slightly higher maximum spend of $2,000 a quarter compared to its competitors. Then, you earn 2% back on your choice of one type of everyday purchase, such as gas stations or grocery stores, and 1% back on all other eligible net purchases. What are common cash back categories? When we asked consumers in November 2018 what their favorite rewards categories are, we were a little surprised to find that time and again, they turn to groceries overall, with travel following close behind. Consumers have figured out that they can really earn with groceries: Spend $500 a month for a year with 3% cash back and earn $180 back – enough to pay for a week's groceries! Interestingly, each region dominates a different category: While the Midwest is at the top with groceries, consumers in the West like travel, gas stations are most popular in the South, and the Northeast goes for dining. Our own CreditCards.com analyst, Ted Rossman, reminds us that you want to make sure the card you choose matches your lifestyle. "Whether you're planning a family vacation, stocking up at the grocery store, enjoying a dinner out with friends, or refueling your car on the way home, credit cards can reward you for things you're planning to purchase anyway." There are also business cash back cards, which reward you for spending on advertising, utilities, software and hardware, travel, and more. What is the average cash back rate? Cash back cards appeal to customers for a number of reasons, but mainly due to their ease and flexibility: Because they offer cash back rewards, there’s no need to convert points and miles to dollar values. In fact, polls show that people prefer cash back cards by a ratio of 3-to-1. While many people prefer cash back cards because of their simplicity, the cards also have their drawbacks, so we've compiled a shortlist of the advantages and disadvantages of using a cash back rewards card. If you’ve ever contemplated whether a cash back card can help you, here are some key considerations to keep in mind as you make a decision. Easy to work with – Cash back cards may be the simplest way to earn rewards since cardholders know exactly how much they will earn back from each purchase without having to convert a point or mile into an equivalent cash value. Lots of redemption choices – Cash back rewards can be redeemed in a variety of ways, including statement credits, checks, bank deposits, gift cards and charitable donations. Sign-up bonuses – More than 60 percent of the cards surveyed offered sign-up bonuses – of up to $200 cash back – after spending a certain amount within a specific timeframe. Some of the best sign-up bonuses on the market are offered by cash back cards. Good cards for everyday spending – These are good cards for earning rewards on restaurants, groceries, gas and other everyday expenditures. Can keep building credit – If you pay in full and on time each month, you can continue to build your credit, allowing you to eventually graduate to a premium rewards card. Makes for good practice – These cards are a great way to practice using a simpler rewards card until you feel ready to move on to a more ambitious rewards product. No annual fee – Most cash back cards have no annual fee, yet they often have sign-up bonuses of $150 and more. Out of the 52 cards polled in our yearly cash back survey, only four had annual fees. Choice in benefits – Increasingly, cash back cards offer such benefits as purchase protection and extended warranty. Limited expiration dates – Although some cards place restrictions on the amount of time you have to redeem your cash back rewards, the vast majority do not. Only eight out of 52 cards had expiration dates. Added bonus – If you load your cash back rewards back onto your credit card, it will earn its own cash back when you spend it. Cash back cards aren't for everyone. For example, the world traveler may want to look elsewhere, and some cash back cards can have onerous rules. Lack of travel benefits – When you choose a cash back card over a travel rewards card, you typically lose out on such features as airport lounge access and annual travel credits. Not ideal for travel – Unlike many travel rewards cards, cash back cards often have foreign transaction fees, making them not ideal for foreign travel or shopping online with companies that use foreign banks. Limited redemptions – Some cash back cards have limited redemption options. For example, you may not be able to redeem with a check. Cash back may expire – Some issuers may require you to redeem within a specific amount of time. Maximum spend requirements – Most cards with rotating categories cap you with a maximum spend. Sign-ups required – Some cards require you to sign up each quarter to qualify for the increased rewards. Minimum spend requirement – To earn cards' sign-up bonuses, you are typically required to spend a minimum of up to $1,000 within a set amount of time. To quickly bulk up rewards earnings or meet the minimum spend requirement for a sign-up bonus, you should use your cash back cards for as many of your everyday purchases as possible. A large purchase – such as furniture or another major purchase – can help you meet a spending threshold and score a large amount of cash back in one swoop. However, using cards for your everyday spending – including groceries, gas and utility bills – is the best way to go if you want to earn a large amount of cash back over time. Note that you need to watch out for merchants that tack on a convenience fee, since this can negate the value of your cash back. If you sign up for multiple cash back cards that offer bonuses in different spending categories and rotate them to earn bonuses in each of the spending categories, you can increase the rate of cash back that you earn. You need to take care to pay your card by the due date, since the late fees and penalties from a missed payment can quickly negate any cash back that you earn. For instance, a late payment on a $500 balance can add up to more than $40 in penalties and interest. Even if you make your minimum payment on time, the interest that you have on a rotating balance can easily outmatch the cash back that you earn. Over time, you may find yourself owing more than you earn. Cards that offer sign-up bonuses usually have a minimum spend requirement that needs to be met within a certain amount of time. So, with the Chase Freedom cards, you have to spend $500 within the first 3 months of card membership to get the $150 bonus. Make sure you pick a card that has a requirement you can meet. Some cards reward for signing on an authorized user or referring new cardholders, so check for that. Look at your spending before choosing your card. If you find that you spend a disproportionate amount on, say, groceries or restaurants, let that inform your decision. If you love to shop at Amazon, then a card that rewards for shopping there may be best. After your first year of card membership, if there is an annual fee, consider calling your card issuer and asking if they'll waive the annual fee a second year. Our study shows that when cardholders ask for better terms on their cards, chances are they'll get it. The most generous cash back cards will usually have a high barrier to entry. While you want to get the best card possible for your credit rating, you also want to minimize inquiries into your credit history, which can lower your credit score. You should check the required credit rating for a card and make sure you can qualify before you apply. Recall that there are three primary types of cash back cards: flat-rate, tiered, and rotating category. The type you choose will depend on whether you prefer simplicity or the ability to maximize your cash back through bonus categories. You should take a look at a cash back card’s bonus categories to make sure they match your spending habits. For instance, if you have a family that eats at home most of the time, you may be best off with a card that offers a bonus on grocery purchases, whereas if you dine out often you may prefer a card with a bonus on restaurant purchases. Or, you may get a higher cash back rate with a card that offers the same flat rate on all your purchases. You should factor any sign-up bonus into your overall card rewards. Depending on whether you plan to hold the card for the short term or the long term, it could put you ahead of a card with a higher cash back rate, but no sign-up bonus. Cash back cards usually don’t include an annual fee, but a few do – such as the Blue Cash Preferred card from American Express. Don’t be deterred by a card with an annual fee. Depending on your spending habits, you can often earn more cash back, even once you subtract the fee. Also, there are cards with annual fees that waive the fee the first year, making your first-year savings that much more generous. Think in the long term about how you plan to use your card. If it's a card you plan to use for the long haul and for moderate expenditures, a no annual fee card may be best. How hard do you want to work to get your cash back? You should consider the flexibility of the card’s redemption options, including how often you can redeem your cash back (some cards only allow you to redeem once a year), how many options you have for redeeming your cash back, how much cash back you need to collect before you can redeem it and whether you can set your account to redeem automatically to save yourself some work. If you plan to look for a 0% intro APR offer with cash back options, make sure that you pay in full any new purchases if there is no 0% purchase offer. Also, factor in the balance transfer fee, which can be up to 5%. That said, The Amex Everyday® Credit Card from American Express† is an example of a cash back that offers no balance transfer fee if you meet its terms. Interest rates and penalties are probably not the top priority for consumers who are considering a cash back card. Of course, you should avoid carrying a balance on the card, but you should also apprise yourself of a card’s interest rate before you apply, and keep an eye out for rates that are far above average. If you are planning to use your cash back card outside of the U.S., you should look for a card with no foreign transaction fee, to spare yourself a 2 to 3 percent fee on all your charges. In addition to cash back on all your purchases, cash back cards often include benefits that can add to a card’s value depending on how you use them. Common benefits on cash back cards include travel and purchase protections, such as car rental insurance and extended warranties. How much do you spend on credit cards on average? Which categories of purchases do you spend the most on? How long do you plan to actively use the card? As you can see, annual fees can be deceiving. Even with a $95 fee, the cardholder comes out ahead with the Blue Cash Preferred card in the first year, thanks to the card’s generous bonus on U.S. supermarket purchases and $200 intro bonus after spending $1,000 in the first 3 months. Don’t forget to compare the card’s other features before you choose your cash back card. Also, you should compare benefits – such as travel and purchase protections – that can add significant value to the cards. As you can see, the Citi Double Cash and the American Express Blue Cash Preferred card both offer a large list of additional benefits. Who says you have to sign up for just one cash back card? You can sign up for multiple cash back cards and rotate them to earn additional cash back in the bonus categories. Cards such as the Citi Double Cash card and Blue Cash Preferred card make great companions to one another – you can use the Blue Cash Preferred card to earn 6 percent back on your U.S. supermarket purchases, 3 percent back on your U.S. gas purchases and then use the Citi Double Cash card to earn 2 percent back (1% when you buy and 1% when you pay) on the remainder of the purchases. The most common redemption options for cash back cards are statement credits, checks mailed to you, bank deposits, prepaid gift cards and charitable donations. To redeem your cash back, you can go online or call the issuer directly to specify in what form you want to receive the cash back. Some issuers will allow you to opt to have the rewards automatically applied each month, while others require you to request the rewards each time you want to use them. The amount of cash back needed to redeem your rewards varies depending on the specific card and the redemption option. Read on to see what options are available for Discover, Citi, Chase and American Express cardholders. Redeem for gift cards from more than 100 popular brands, starting at $20. At least $5 free will be added to each gift card. Pay with rewards at Amazon checkout with no minimum. Make a charitable donation, starting at a penny. Deposit any amount into your bank account or apply to your Discover bill as a statement credit, starting at a penny. Discover rewards never expire; however, if your account is closed or not used within 18 months, Discover will credit your account with your rewards balance. Request a check for at least $25 up to the total cash rewards balance at the time you redeem. Redeem for a statement credit to your card account for at least $25 up to the total cash rewards balance at the time you redeem. Get a gift card in preset denominations from the available inventory. Redeem for a credit to your linked Citi savings or checking account or to a checking account from which you have paid a Citi credit card bill at least two times. Your cash rewards balance will expire if you have not earned cash back from purchases or payments for 12 months. If you close or convert your card account, you must redeem any eligible cash rewards prior to account closure to avoid forfeiting your rewards. If your card account is closed by Citi, you cannot redeem cash rewards and you will forfeit any accumulated cash rewards. Chase cardholders can redeem cash back rewards at a 1:1 value for gift cards, travel and more through Chase Ultimate Rewards. Redeem for cash at any time, for any amount. Redeem cash back for a wide variety of gift cards. Your cash back will not expire as long as your account remains open. However, if Chase closes your account due to fraudulent activities, failure to pay or other reasons, you will immediately lose all rewards. Redeem as statement credits in increments of $25 whenever your available balance is $25 or more. At times, AmEx may offer alternative redemption options, such as gift cards or merchandise. We recommend that you familiarize yourself with the terms and conditions of your credit card’s rewards program. To avoid losing any rewards, be sure to use rewards before they expire or prior to closing your credit card account and pay your bill on time each month. What is a statement credit? A statement credit is money issued to your credit card account either as a rewards redemption or a reimbursement. While cash back cards typically allow cardholders to redeem their cash back as a statement credit, several cards also offer bonuses in the form of statement credits. Rewards redemptions – Cards may let you redeem your cash back, points or miles in the form of statement credits. Travel credit – Cards sometimes offer annual travel credits that reimburse cardholders for purchases made directly through the airline or hotel. Annual bonus – Several credit cards offer a bonus – sometimes worth $100 or more – each year on your card member anniversary. Returns – When you return an item to a store or merchant, you will receive a refund to your credit card account in the form of a statement credit. Are cash back rewards taxable as income? Depending on how you acquire the rewards, cash back may be taxable. It basically boils down to whether you spent money to earn the rewards or if you received them for simply opening a bank account. When your rewards are based on the purchases you make, the Internal Revenue Service considers them nontaxable rebates. They are, in the IRS’ eyes, simply a reduction in the price you paid for goods or services. This has been the IRS’ position since 2002. However, if you are awarded rewards as an incentive to switch or open a new bank account, those may be taxable. For example, in 2014, a Tax Court judge ruled that a couple who received airline miles for opening a new Citi bank account must count as income the value of the airline ticket they received for redeeming their rewards. According to the court, something was given in exchange for depositing money into the bank, and in this case, the points were equivalent to interest for the money. Subsequently, the receipt of interest, whether as cash or as redeemed mileage rewards, constitutes as taxable income. Interested in learning more about each card? We’ve reviewed several cash back credit cards – check them out in our reviews section. † All information about The Amex EveryDay® Credit Card from American Express has been collected independently by CreditCards.com. The Amex EveryDay® Credit Card from American Express is no longer available through CreditCards.com. Robin Ratcliff is the managing editor for reviews on CreditCards.com. Before CreditCards.com, she worked as a analyst and editor, and still brings that same analytical rigor to her card recommendations today. You can reach Robin at robin.ratcliff@creditcards.com. Tracy Brackman is a credit card news editor at CreditCards.com, writing breaking news stories on card updates and new card launches. You can reach Tracy at editors@creditcards.com. Laura Mohammad is an editor and writer at CreditCards.com. She regularly covers the best credit cards and works to bring you the most up-to-date analysis and advice. You can reach Laura at laura.mohammad@creditcards.com.